This is the third time we have stayed at Indian Waters. It is one of our favorite places to stay. It is a large park with mostly back in sites. Sites very a great deal and have different nightly rates. All of the back and sides have two concrete pads. One for the RV and one for the additional vehicle. This make spaces about twice as wide as found in typical parks. As other reviewer's have mentioned, the concrete pads and some sites are surrounded by grass in others by gravel. Grass sites are more expensive as our sites that are closer to the pool and other amenities. 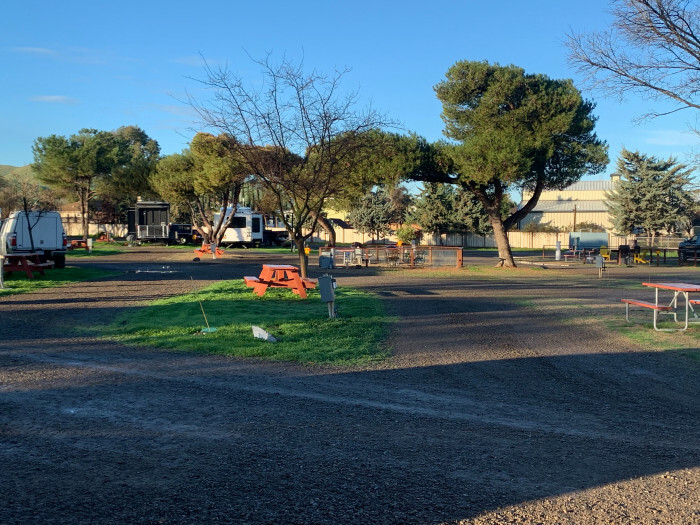 Also some sites have a concrete patio between the RV site and the car site. These are also more expensive. We had a gravel site close to the pool With a patio. It was very nice with plenty a room and privacy. Probably the best thing about this park are the amenities and activities. It is a very busy park with four pickle ball courts two bocce ball courts two pools and two hot tubs. There is a work out room and a billiard room also. One of the pools has a constant depth and is used for water volleyball and water aerobics. Pickle ball seems to be the game of choice here and all 4 quarts are in constant use. There are lessons and tournaments. Also lots of bocce ball and water volleyball. There is also a written schedule of activities in the clubhouse. There do not seem to be any permanent residence, but most of the customers seem to be in the park for a couple of weeks to a couple of months.Everyone seems to be having a great time. There is no cable TV so would be good to have satellite. There is some over the air television. 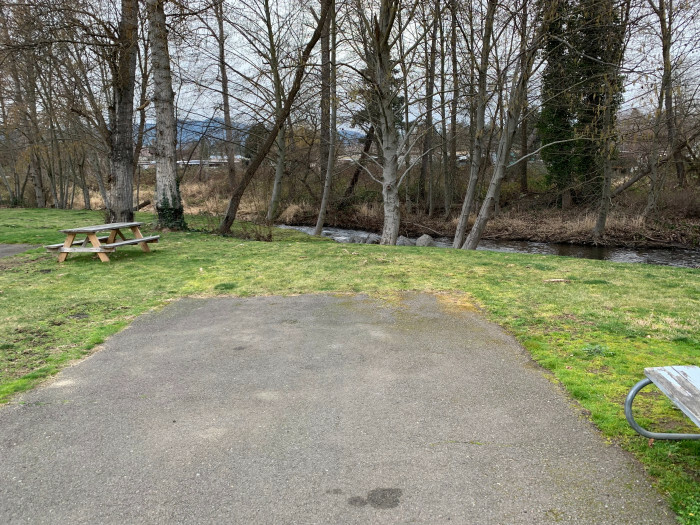 I would give this park a perfect ten if it had a little more landscaping between sites to increase privacy and maybe picnic tables or some kind of outdoor furniture at the sites. 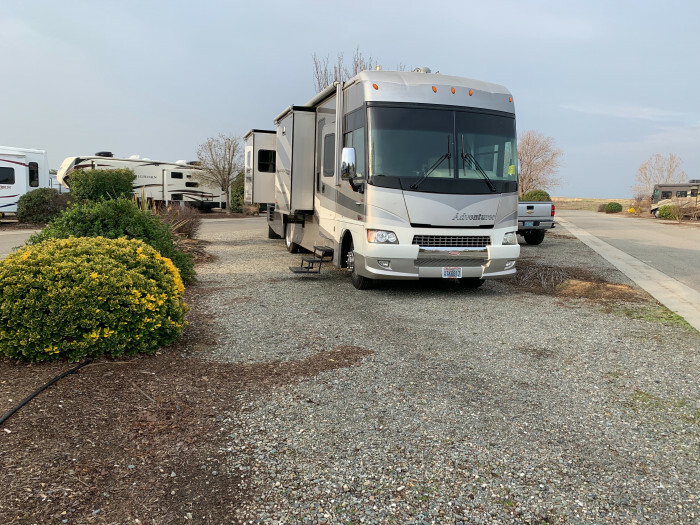 We camped at Indian Waters RV Resort & Cottages in a Motorhome. Sites in this park vary tremendously. There are large areas where RV's are packed in like sardines. I have rarely seen sites so close. It looks like a lot of people in these sites are relatively long term residents. We had one of the 18 sites in a circle around a cabana. Lots of room and nice views of the surrounding hills. We had a lawn next to our site with a picnic table. The pad was gravel an a little messy. There was no landscaping or privacy. They keep a list in the office of satellite dish friendly sites and allows us to pick one. A nice touch. The nicer sites cost more but are worth it. There are lots of amenities- pool, tennis court, store, etc. 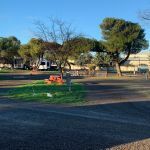 We camped at Valencia Travel Village in a Motorhome. We have been here before. This is an older park and the sites vary a lot in attractiveness. All the roads and sites are gravel and dirt. Some sites have some grass and some doing. Spaces between sites is a little tight, but ok. There are a lot of mature trees which would provide some shade in the summer. It rained the night we were there and things got pretty muddy. There are a large number of long term residents and some of the sites are pretty messy. The long term residents are mostly together in one part of the park. The park is about three miles from I-5 and pretty quiet. We camped at Los Banos West / I-5 KOA in a Motorhome. Large parking lot with 72 identical spaces. Paved roads with dusty gravel RV spaces with a narrow barked space with some shrubs in between. Hook ups, but no other amenities. No cable and the only restrooms and showers were in the "Travlers Clubhouse" which is shared with a large truck stop and quite a hike. No assigned spaces. When you chec in at the Clubhouse the tell you to pick any empty site. I would see no reason to stay here except for the Tribal casino and the inexpensive all you can eat buffet (breakfast, lunch, and dinner), and maybe the price. There are many nicer parks in the area. 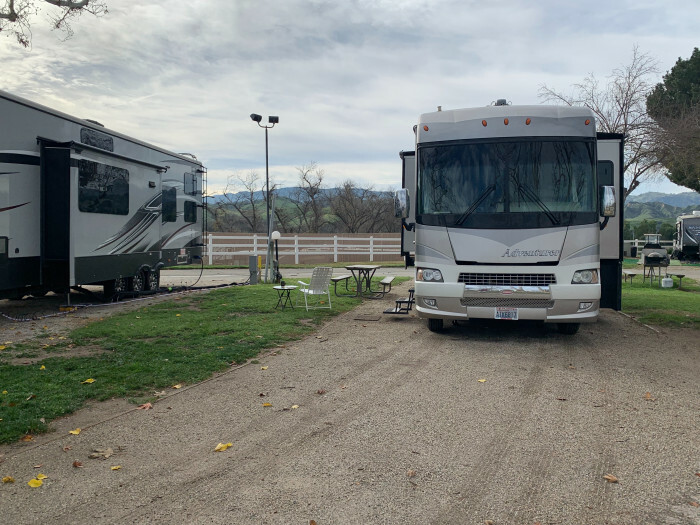 We camped at RV Park at Rolling Hills Casino in a Motorhome. We have stayed here multiple times, either traveling south from Seattle or while going to plays in Ashland. 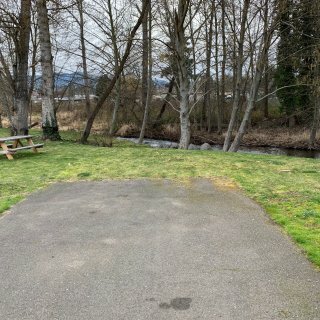 It is a nice park with a creek along one side of the property. Paved sites with grass in between and a picnic table. Spaces are a little tight. Good hookups with cable TV. A lot of long term residents, but they save a bunch of long pull through sites facing the creek for shorter stays. Also some nice pull in sites right on the creek for smaller RV's. Easy access from I-5 but no road noise. 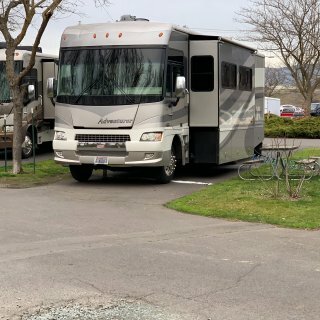 We camped at Holiday RV Park in a Motorhome. We have been here twice before. Very clean and well maintained park. Spaces are tight and this time of year mostly long term residents. Concrete pads with grass or gravel in between. Some trees and shrubs. Restrooms and laundry facilities are very nice. They save some nice pull through sites near the rest rooms and laundry for overnighters. Easy access from I-5 but no road noise. Very peaceful. 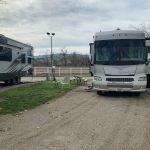 We camped at Blue Ox RV Park in a Motorhome. This is a very attractive and well cared for RV park. It is in the woods with lots of native trees and plants between spaces. There is also a lot of open space in the park with nice lawns and gardens that makes it look like a park. There are a large proportion of long term residents, but everything is very clean and tidy and there isn't a bunch of stuff accumulated in the long term sites. It shows that it is possible to have long term residents and still have a clean and attractive park. Most of the longer term residents are in back in sites scattered around the park, with lots of green space in between. There are a number of pull through sites near the entrance for shorter stays. They don't have as much privacy as the back in sites, but are fine for a shorter stay. This is a family owned park and the owners are very helpful and accommodating. Clean restrooms and laundry facilities but not much else in the way of amenities. We enjoyed our stay here and will be going back. 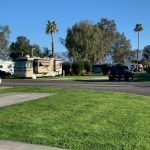 We camped at Deerwood RV Park in a Motorhome. We have stayed at this part twice, both times for just one night. We had difficulty this time with our hookups. It was a pull through site which was big enough, but it appeared that sites had been reorganized and the utilities left unchanged. Out sewer was on the opposite side from the electrical and water and was underneath our neighbor's picnic table. Luckily we didn't need to use it. Also lots of longer term residents and the usual stuff that accumulates around them. The site was level and big enough, just the problem with the utilities. We had a better site our previous visit. The park is convenient to I-5 and easy to get around in. Didn't use any of the facilities. Ok for one night, but would not stay longer. 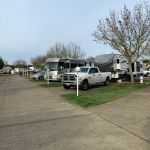 We camped at Sac West RV Park and Campground in a Motorhome. The park was very clean and well cared for. Most of the sites were not great, however. Especially given the price. Close and little privacy. Sites vary a great deal in the same price range. Sort of luck of the draw. The back in sites seemed to be a little more private than the pull throughs, but that is only a generalization. There is attention to landscaping and the overall looks of the park was pleasant. Great location in Paso Robles. From what we could tell, this is probably the best option in the area. We would definitely return. We camped at Wine Country RV Resort in a Motorhome. This is a busy place. Besides the RVsites, there are vintage travel trailers, safari tents and cabins you can stay in. All very well done. There are a variety of RV sites which vary in size and privacy, and price. Two beautiful pools, bocce ball courts, etc. Service was good and the park was clean and well maintained. Seemed to be employees everywhere maintaining the park, but it was spring and the beginning of the busy season. When we were there it was peaceful and not too busy. I suspect that in the summer the place is a zoo. We had a great time and would definitely return, but probably not in peak season. 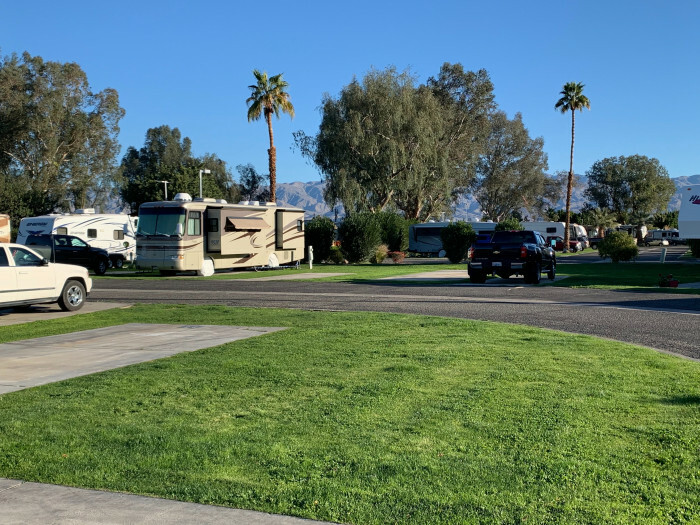 We camped at Flying Flags RV Resort & Campground in a Motorhome. We stayed at Chula Vista RV Resort for a month in February. The amount we paid was for a monthly rate, and for a premium site at the end of a row. It is a far above average park and we will return next year. Spaces are all concrete, both pull throughs and back ins. The concrete pads are both long and wide. Plenty of room for the car and also a picnic table and other furniture along the side. Spaces between sites were a little tight as others have mentioned, but hedges and other well maintained landscaping makes up for it. Spaces were no tighter than 95 percent of the parks we have been to. There are a variety of sites. We had a pull through at the end of a row which was very nice. Next year we have reserved a bacon site on the perimeter with a view of the bay and Coranado island. Service was great. 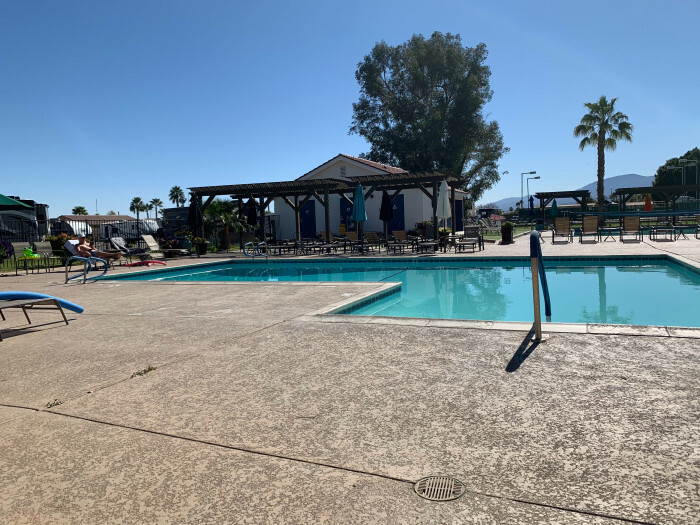 Daily trash pickup, very clean restrooms and a great pool and exercise room. The RV Park is bordered on two sides by a nice city park which was a plus. Also lots of planned activities if you are into that. Also no permanent residents which was a plus. Lots were there for a couple of months but not much longer. Park is convenient to San Diego, about 15 minuets up I-5. No complaints at all. Would ave rated a perfect 10 if there had been a little more space between sites. 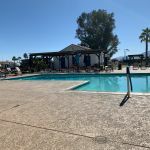 We camped at Chula Vista RV Resort in a Motorhome. We have stayed here twice. Good location when traveling south. 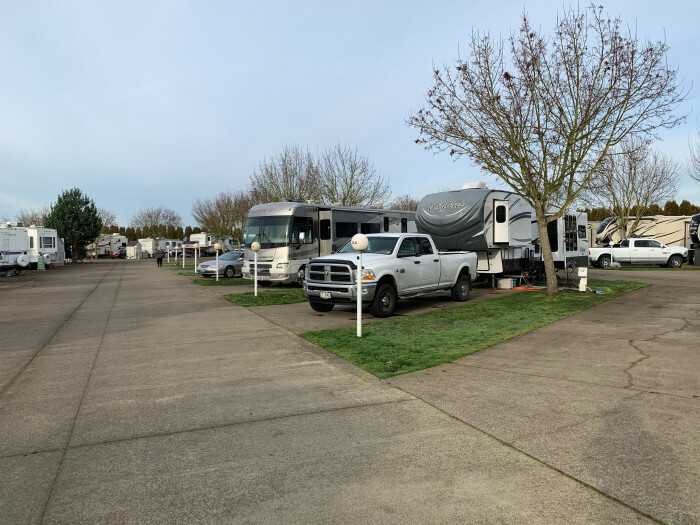 This is a pretty large park and RV's are packed in pretty tight. Well maintained lawn between spaces and some nice shade trees. Mostly pull through spaces. Our space had a nice lawn, a picnic table and a good view of the surrounding hills. We would always come back here. We camped at Valencia Travel Village in a Motorhome. Typical parking lot type park. Large flat area with a few trees and gravel roads with pull-through sites in between. Decent space between sites, probably about 12 feet of lawn. Sites were also pretty short, just barely enough room for my 36 foot Class A and the car. Don't know if there were longer sites or not. Park was clean. Decent cable TV and good hookups. Didn't use the restrooms. 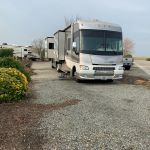 We camped at Los Banos West / I-5 KOA in a Motorhome. The park was clean and well taken care of. There was a large pool which was not yet open. Very clean restrooms and showers. Would have given a higher rating has sites no bee so close together. Space between sites was only about eight feet at the most. Spaces between sites were either gravel or grass which seemed sort of random. Location was convenient. Far enough from the freeway to avoid the noise, but within walking distance of restaurants and groceries. 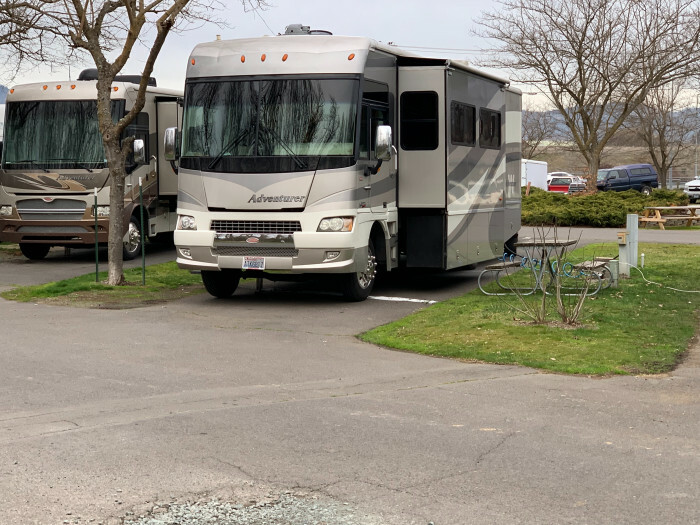 We camped at Heritage RV Park in a Motorhome. We like this park and have been here before. KOA has recently acquired this park and is busy making upgrades. I hope they don't screw it up. Sites are gravel pull-throughs that are parallel to interior roads. The park is in the woods with nice views of the surrounding hills. Our site had a deck with a table and chairs and an umbrella. Also a Weber BBQ with a full propane bottle. The park has wild turkeys and a water fall with a swimming hole. Possibly the only complaint is no cable TV. Not much over the air because of the hills and too many trees for reliable satellite reception. Staff is always very helpful. We camped at Grants Pass KOA in a Motorhome.